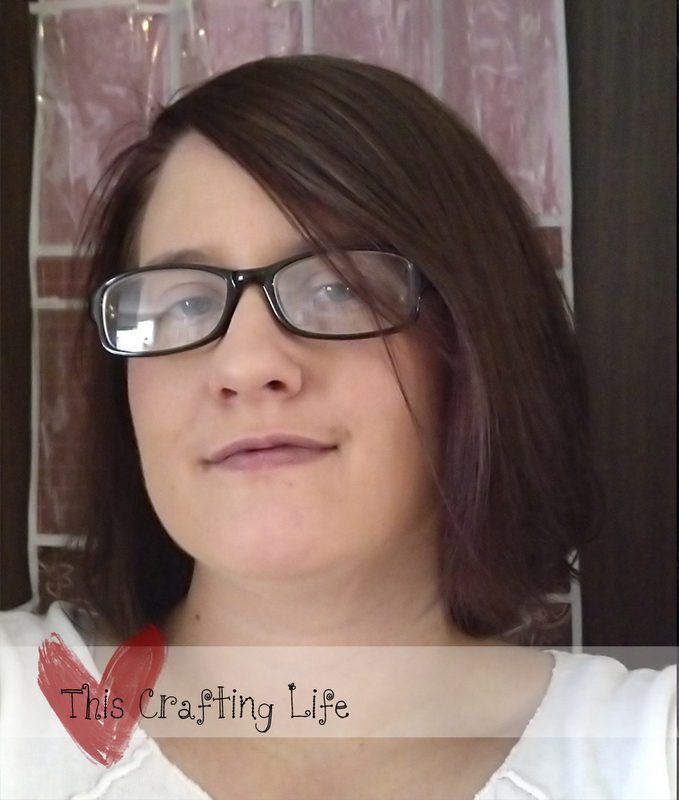 This Crafting Life: Garnier Olia Hair Color Review! I recently had the pleasure of trying out a new hair coloring product from Garnier, called Olia. 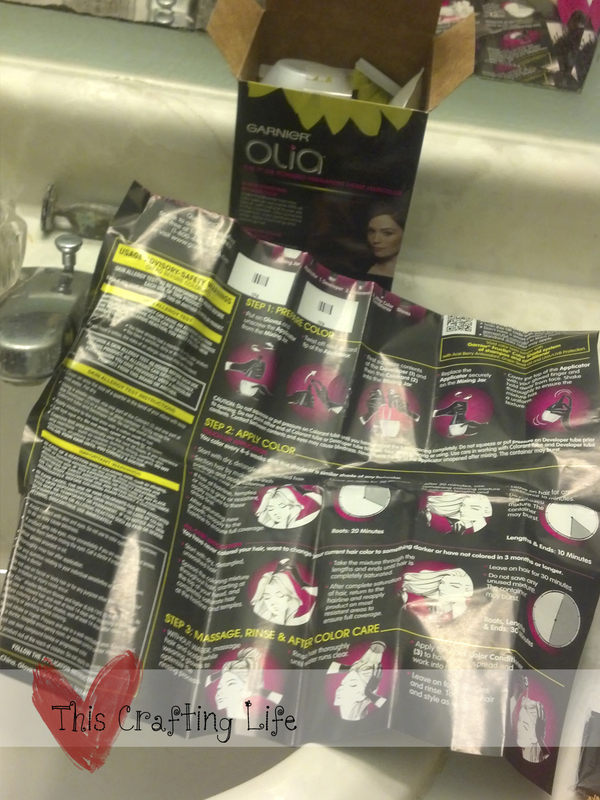 It is an oil based hair color, that is supposed to be better on your hair than regular ammonia based dyes. I have to admit, when I first heard about this product I was not sure what to think about it being an oil based color. I wondered if it would work as well as the other hair colors that I have used in the past. I went shopping to get my Olia and was pleased by the selection of hair colors, quickly finding a dark brown that I thought would be nice. I couldn't wait to get started! When I first opened up the box, I found 4 containers- developer, color creme, a mixing bottle and conditioner. When I opened the developer to add it to the mixing bottle, I made a little bit of a mess. This made me wonder why the developer wasn't already in the mixing bottle like some other brands I had tried. A small matter, however, and I easily moved on. After I got everything mixed I started to apply the dye. It spread easily and I was most surprised that there was no strong odor like other dyes. It actually had a very pleasant smell! I tend to use my hands a lot to spread the dye and make sure that I get all of my hair, and after my gloved hands were wet, I found the mixing bottle a little difficult to hold onto because of its round shape. The gloves were nice and thick, but I couldn't really see the hair dye on my hands because they were black. After application, I waited for the 30 minutes required and followed the rinsing instructions included. The conditioner had a nice smell, not overpowering like some. When I got out of the shower and dried my hair, at first I was disappointed. It did not look near as dark as it did on the box. I was a little worried that I would want to redye it later. I went about my business and came back about an hour later to see that it had developed to its full potential. This would have been something nice to know before I got really bummed out about it.I love the color now that it's fully developed!! The first day that I showed up to work after doing my Olia coloring, all of my coworkers were amazed. Everyone thought the new color was great and they couldn't believe how nice and shiny my hair was. Everyone wanted to know what salon I had gone to! I just laughed and told them about my awesome Garnier Olia experience! I think I definitely changed some minds, including mine! Overall, the only complaint I have about the experience were packaging issues. In the future, I might use a different bottle and my own gloves, but otherwise, it's a great product! Can't you see the improvement? It has a much nicer texture! Disclosure: I received this product free to review as a BzzAgent, however, the opinions are all my own. I will always give you an honest review! 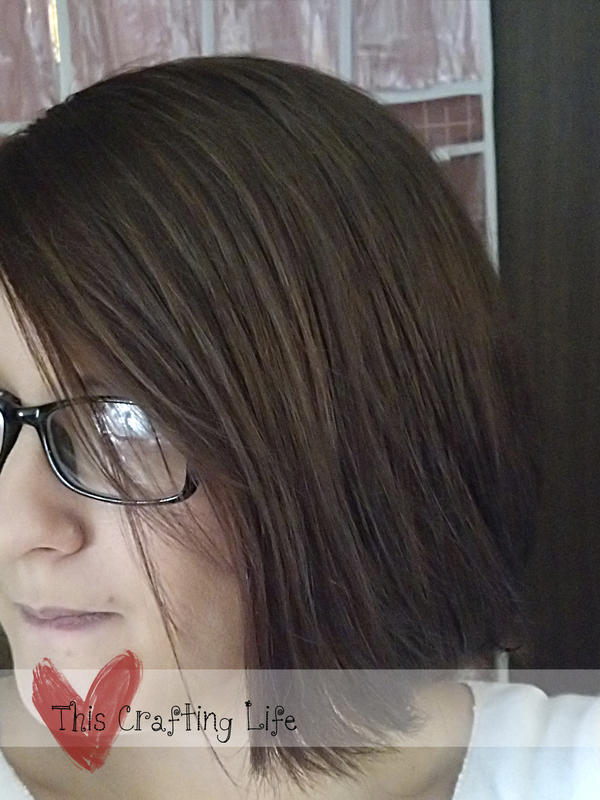 I did this one too and also chose a dark brown and I love the change it gave me. I just used for the first time also..and although I found the application bottle to large to manage. I will use again. 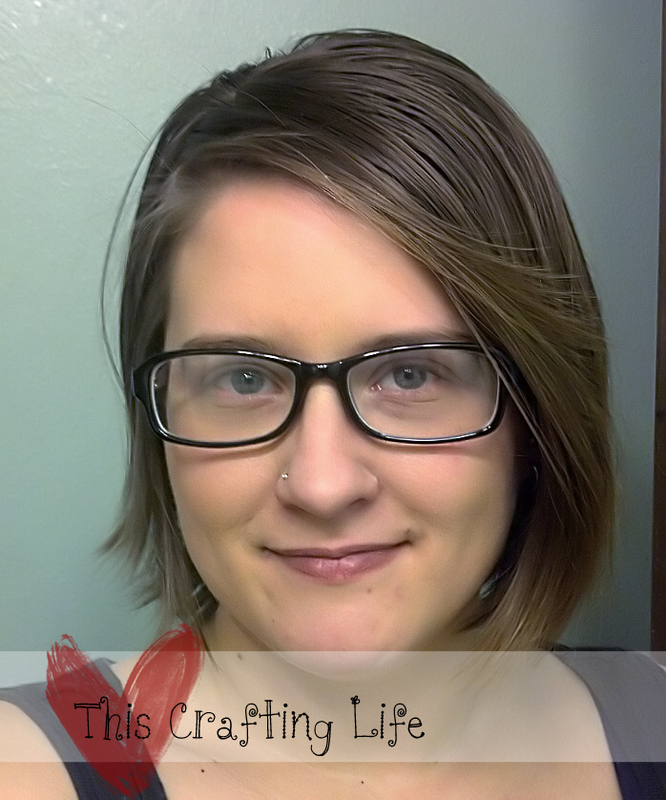 I have used clairol for years...I have grays I have had since 17 yrs old. I am on week two and still no grays. WIth clairol I could see on Week one! But I have to say the shade I had at clairol I loved. I tried out Olia recently too, and responded to their questionpro survey too. I was a bit disappointed at the lack of vibrant colours. I really liked the texture of the dye – it’s very creamy, so it hardly dripped at all, the scent isn’t offensive, and it didn’t irritate me at all. With the creamy texture, it didn’t seem to go as far – I probably should have picked up two boxes instead of just one… The developer in a separate container seems like a waste of packaging, and the mixing/application bottle is really poorly designed – there was a LOT left in the bottle even when I couldn’t squeeze any more out. After half an hour the colour hadn’t seemed to develop yet, so I left it on for another 20-30 minutes. The results aren’t great – they’re very subtle. Not really what I expected. Washing out the conditioner, my hair felt oily – as though it were over-conditioned, however when it dried, it felt very dry as though I hadn’t used conditioner at all. I thought the product was ok, but nothing special, and not worth paying more money for it over another brand.